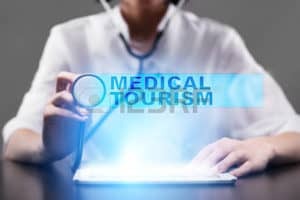 Work Comp Medical Tourism – A New Frontier? 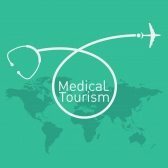 The subject of Work Comp medical tourism was something that I scoffed at when I first heard about this interesting Risk Management technique. 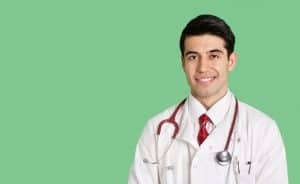 However, when I started talking with one of the medical tourism bloggers – Richard Krasner – the subject peaked my interest greatly. This blog always is in search of technology for Workers Comp. The bottom line is that improvement and savings in WC, may not be with a smartphone and an app. While this is not a techno-innovation, it may be an accepted practice soon as Washington and Oregon already allows this practice to some degree. An article from Richard’s blog is below used with his permission. His byline is at the end of the article. 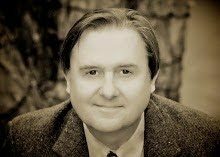 I received an email Friday from one of my LinkedIn connections, Joe Burgess, Senior Executive Vice President for CHSI in Las Vegas. Joe and I had connected back in January, and he mentioned at that time the name of a company called SIMNSA. He informed me that SIMNSA had started a project in regard to cross-border health care for workers’ comp into Mexico. This was in response to my inquiry into any work his company may have been doing with cross-border health care for workers’ comp, since his company is based in the Southwest. So on Friday, Joe was kind enough to send me a link to a website called Workers’ Comp Executive. The link was a video on that website hosted by the publisher of Workers’ Comp Executive, Dale Debber. Joe told me that this was a program that his company was pushing for the WC self-insured group they used to manage. He indicated that the self-insured group did not go with it at the time (and may have since) but a company called Insurance Company of the West (ICW) did, which is the subject of the video. Without going into great length about what is on the video, since it is thirty minutes long, I will just give you a brief description of what came about from the first few minutes of the video, and I will let you decide if you want to watch the video in its entirety. Dale, the publisher of Workers’ Comp Executive interviews Paul Zamora, Senior V.P. 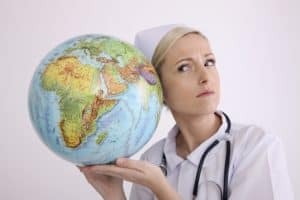 for Workers’ Comp for ICW, and as Paul explains, the idea to explore cross-border health care for the employees of ICW’s San Diego area insured clients came from an agent for Alliant Insurance, Larry Osborne. As Paul tells Dale, SIMNSA is providing many of the businesses in the San Diego area that have employees who live in Mexico, but commute to work in CA, as their HMO, since SIMNSA is the first and only Mexican HMO licensed in CA to offer an HMO product. 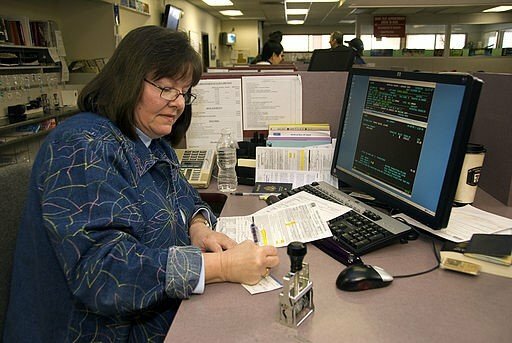 The employees are given the option of choosing SIMNSA or any other company for their employee health care plan. And it was Larry Osborne who said to Paul, why can’t they do that for workers’ comp. ICW was a little sceptical at first, but their legal team said that they did not give up their right to control medical, if they were using a non-CA domiciled company. They were told no, they do have the right to have their primary care doctor in CA, and outsource services elsewhere. At this point, Dale interrupts Paul to ask a very good question. “Does that mean that the utilization review is being conducted here in CA under the control of ICW, but the treatment is on-going in Mexico for those who choose that?” Paul replies that is correct, and then explains that if an employee is injured, first he will see a primary treating physician in CA who is familiar with SIMNSA, then all future treatment if there is any, is via SIMNSA, with follow-up visits on a routine basis with their primary care physician here.Paul goes on to say that it is the employee’s choice, and that at no time do they tell an insured that they have to have their employees treated by SIMNSA. It is always the employee’s choice to use SIMNSA. Currently, this program is only in the San Diego/Imperial County area, as Paul tells Dale, because companies in other areas do not have employees that commute for work to CA from Mexico. Paul goes on to say that the quality of care is very good, and there are excellent doctors in Mexico, and that it is very convenient for the worker to be treated in Mexico. Dale then asks Paul about the fee schedule and he wanted to know if it was an advantage for the employer, and as Paul explains, they were able to negotiate with SIMNSA a better fee schedule because their costs were lower. I am going to stop here and let you watch the work comp medical tourism video yourself, so that you can decide if this is something your company would like to do, whether you are an insurance carrier, employer, self-insured employer, etc. But it appears to me that as the workforce in the US grows more Latino and Caribbean, these kinds of programs will be more common, and in many cases, for lower cost surgical care than what is available currently here in the US. It’s up to you…higher cost surgery with not so good outcomes here, or lower cost surgery with better outcomes in a work comp medical tourism destination facility in the region. Work Comp Medical Tourism Blog can be found here at Richard Krasner. By the unknowing of Nevada Workers Comp Gets Trashed again. Nevada Workers Comp has usually been mostly off-the-radar since converting from a state fund. 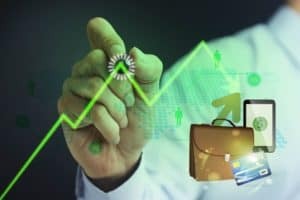 One of the main rumors was the number of companies grew when they left California for a better work environment including Workers Compensation. Recently, there was a large amount of humidity of the articles in my opinion, fell a little short when they consulted no one in the WC claims industry before the industry-bashing articles. – and then try to write about a very specific niche industry – you will write an article like this one on Nevada Workers Comp. At least ProPublica followed up with the likes of Mark Walls (see Work Comp Analysis Group on LinkedIn and others. I doubt the author of the Nevada article even understands WC. 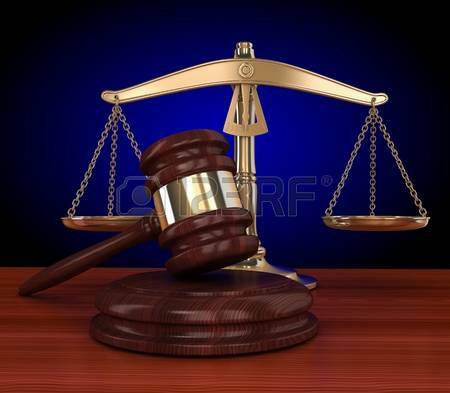 Have you noticed that I have never written about a single case or file and the exact circumstances of what happened? Why – because I may not have had access to the file notes, or other file information that would allow me to make an informed decision. After the blood quit shooting from my eyes, and my blood pressure came down into a normal level, I decided that I could not let that article just float around unchecked. If you read past the attorney advertisements in the comments, one asks how does a liberal arts major get to write about WC at length? I decided that was unfair accusation (even in the comments) , and alas, I thought I will look into the article author’s background, and you guessed it- no WC whatsoever, no insurance, no risk management, no history of investigating and writing about WC. Taking one accident or two and writing an article damning the Workers Comp industry is –fill in the blank—as I do not want to be sued. If and when the author of the article wishes to contact me or someone with some knowledge of the Workers Comp industry, I, and they will be here to explain that one accident does not represent WC. My article on the Defense of WC still stands. The system, no matter how many times it is bemoaned by people looking to get a little attention to their publication, WORKS. Nevada Workers Comp may have its problems – no doubt- but then again, what WC system does not have a few concerns? Insert glass houses and stones here. Yes, I had to give the article a backlink so readers could find it. The 2014 Workers Comp Prescription Cost was actually a bargain when compared to the general public’s cost increase. The results were totally surprising as I had thought the increases would have been very similar. word the link in this sentence. A Risk Manager from a large governmental organization asked me to include any Google searches that I do for articles when possible. As mentioned in my previous article on WCRI’s recent release of Medical Cost Containment measures, Indemnity was the original driver for most of the Workers Comp costs. Medical costs, (especially prescription costs), overtook Indemnity a few years ago and will likely be the main driver of increases in WC payouts for many years in the future. However, the overall Workers Comp Prescription cost increase was anemic when compared to the cost burden on the general public. 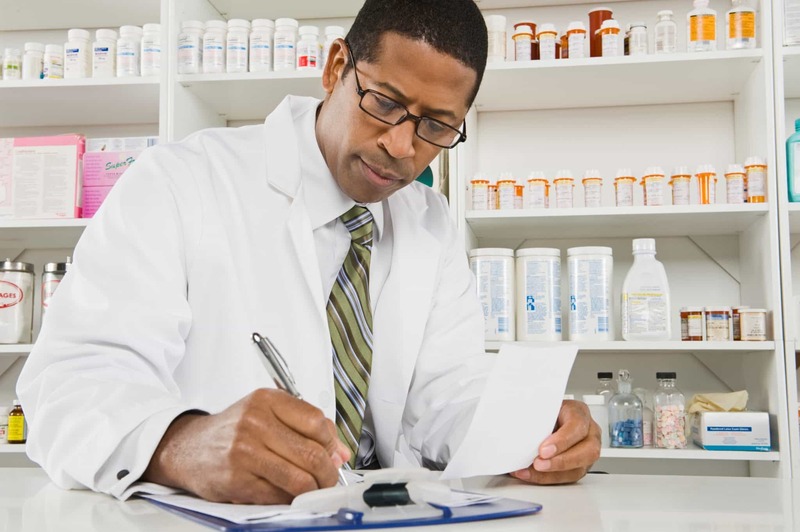 According to Helios , Workers Comp 2014 prescription cost or prices increased 3.9% over 2013. According to Express Scripts drug trend report, the increase for prescriptions overall was 13.1% when compared to 2013. I went to great lengths to make sure that I was not doing the apples versus oranges comparison on the numbers. There was a plethora of different measurements on the prescription prices increases. 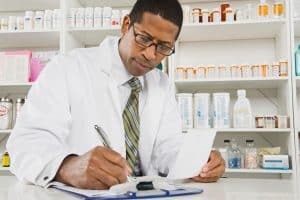 Did Workers Comp PBM’s and medical networks do their job as far as controlling prices increases? From the numbers, one would have to say yes. If anyone has a different set of numbers, I am open to adding them into this article as there are a large number of articles with somewhat conflicting numbers. WCRI Releases National Inventory of Medical Cost Containment Initiatives Adopted In 51 Jurisdictions. Last week, WCRI (Workers Compensation Research Institute released an authoritative work on the initiatives adopted nationally. Medical costs have almost become runaway when compared to indemnity costs in most Workers Compensation claims. State legislatures have become accustomed to tweaking or even overhauling fee schedules and other medical components. Many states have attempted to reign in costs without much of an effect. “This study provides a basic understanding of the cost containment initiatives adopted in 51 jurisdictions and provides additional references for those who want more detail,” said Ramona Tanabe, author of the report and WCRI’s executive vice president and counsel. According to the study, medical cost containment became a focus for many states in the early 1990s when the medical portion of the workers’ compensation benefit dollar began to grow more quickly than other claim costs. This led to growth in the adoption and variety of cost containment initiatives since the 1990s. I would have to agree with that assessment. Indemnity cost containment was on the front burner in the 1980’s when I began my insurance career. Medical cost containment was still on the back burner until the mid-1990’s. The inventory includes tables of statutory provisions, administrative rules, and administrative procedures used by states as of January 1, 2015. 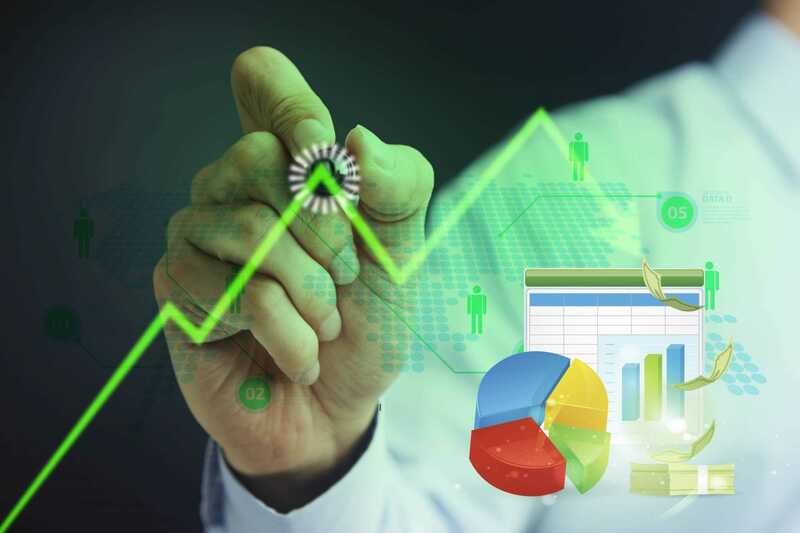 Medical cost containment initiatives include price management methods, such as fee schedules and utilization management (e.g., utilization review or medical networks). The initiatives outlined in the study aim to curb the cost of a particular service or to reduce the amount of services provided. 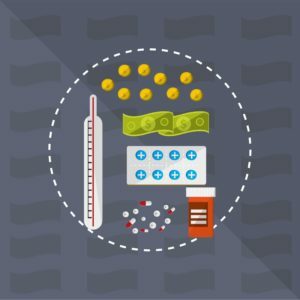 Cost containment regulatory initiatives entail a balancing act of limiting the cost of services and inappropriate or unnecessary treatment without negatively affecting the quality of treatment or access to care for injured workers. For more information on this study or to purchase it, click on the following link: http://www.wcrinet.org/result/MCC_2015_result.html. Last week, an article was published on this blog in reference to Loss Cost Multipliers. The article received a large amount of traffic. 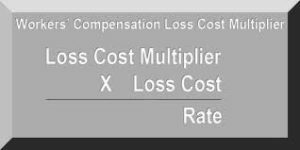 A few questions were emailed to me on how Loss Cost Multipliers generate what a carrier actually charges for Workers Comp premiums. The following is just one example of a large number of Loss Cost Multipliers in a state. This is an actual LCM filing. Any carrier-identifying information was masked. For readability, the numbers are inserted down the page instead of across. *This means that for all Advisory Rates, ABC Insurance Company is adding a markup of 1.4040. For example, the Rating Bureau publishes the advisory rate for Classification Code 8810(Clerical) as .80. The rate that ABC Insurance Company would charge = .80 *1.4040 = 1.12. **The rate is per $100 or payroll. Referring back to the article that I mentioned earlier, if the rating bureau decided to lower the advisory rate from .80 to .75, ABC Insurance Company and their actuaries/underwriters may say that they cannot afford to do business in the state with that much of a reduction. ABC Insurance Company may then file a LCM to account for the reduction. So the formula would be .75 *1.493 = 1.12. In other words ABC Insurance Company, by adjusting their LCM really never reduced their rate even though the state reduced their overall rates. By raising their deviated rate (LCM) to 1.493, ABC Insurance Company is still charging the same rate or 1.12. Carriers may never do this- however when a state rating bureau releases new advisory rates, this may mean little to the employers’ final premiums paid in the state. A 20% reduction in advisory rates may mean very little unless the carriers go along with the reduction. For the “number-crunchers”, yes this was a very oversimplified example, but the numbers still hold true. The Workers Compensation industry seems to be very far behind in any type of technological advancement. Last year, I decided to explore what Android Apps were available for the Workers Compensation industry. Six months ago, the same search was repeated in the Google Play Store. Each year, only one app was usable. Most apps were advertising by mainly attorney firms. The usable app was provided by Sedgwick. 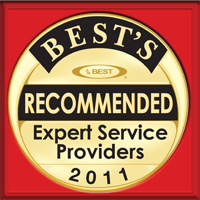 Many companies have approached me concerning apps provided to their clients. I usually then ask why is it not available on the App stores. Having an app on one of the stores is a great marketing angle. (see Sedgwick above) Some of the providers allowed access to their apps. Most fell well short of my expectations. I often provide telephonic advice to investment companies exploring WC companies including ancillary service providers, Third Party Administrators, carriers, etc. Many investment advisers are very knowledgeable concerning health insurance but not necessarily WC. When I compare WC to health, I always mention to subtract 10 -15 years and that is where WC is on the technology timeline. One would not expect a WC provider to apply for a drone license. However, basic access to claims on a smartphone would be a great improvement. If there are any WC companies that have a great app or a new technology, please feel free to contact me. The technological advancement does not have to be an app. This is one advancement that will be at the forefront soon. 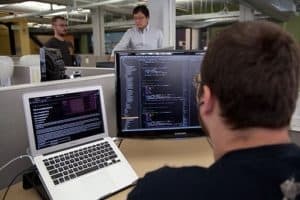 As a side note, I was a former computer systems engineer and programmer for a number of years before my foray into the Workers Compensation industry. I will check on any new apps in the Android App store in the coming weeks. If there is something of interest, it will appear on this blog post haste. Technological advancement in the WC industry appeared at the NWCDC Conference in Las Vegas last year. However, these organizations were not directly related to WC. Classification Code 8810 – Final Answer? Classification Code 8810 may not be the final determination for many clerical office employees at the time of the workers comp premium audit. 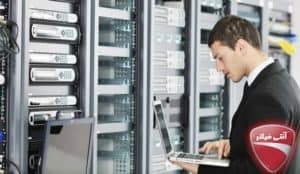 Classification Code 8810 NOC (Not Otherwise Classified) is a Standard Exception Code. We receive a large number of inquiries from employers when, during a premium audit, employees are moved from the 8810 code. The following examples do not mean the premium auditor may have not made a mistake. Any time payroll is moved from Classification Code 8810, an employer should question this heavily. The auditor should have to and usually will justify the reassignment of payroll. The phrase Not Otherwise Classified means that the class code should only be used if there is not a code with a better description of the employer’s operations. 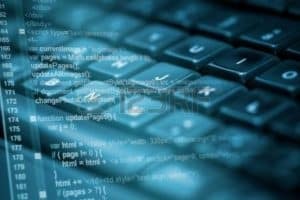 Standard Exception codes refer to classifications that are common to many businesses and that are generally not allowed to be designated as the governing classification. The governing classification is the class code that produces the most payroll in a business. Below is a list of codes that are similar to 8810. However, these codes better describe an employer’s operations in certain cases. Classification Code 8810 and the list of alternative codes do have state exceptions. Eight states do list exceptions to 8810 of varying degrees. Massachusetts seemed to have the most state exceptions. As one might expect, the classification codes tend to be more expensive than 8810. Rate reductions news published by a state rating bureau or NCCI is always a very positive statement in an industry led by negativity. The rate reduction news is then re-published over and over again by various Workers Comp outlets. There is still one piece of the puzzle that is lacking in the positive news. Rate reductions are basically where a rating bureau analyzes actuarial data and subsequently publishes lower advisory or recommended rates for some or all of a state’s classification codes. The buzz now is that California’s WCIRB (rating bureau) has recommended a 10.2% rate reduction which may seem contrary to the veiled WC crisis the state has been experiencing for the last seven years. What does the reduction in advisory rates mean? – actually not much or even nothing. I have written in this blog many times concerning (and there are many confusing terms) deviated rates or Loss Cost Multipliers that are filed by each carrier. There are some that are over 300% of the actual advisory rates. 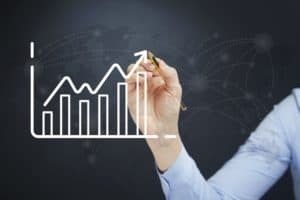 In very simplified terms, an insurance carrier can negate an advisory rate by filing a rate increase that matches the rate decrease. If I am ABC WC Insurance Company and I do not wish to decrease my insurance rates, I will change my deviated rate to match the decrease. This situation does not happen that often. However, this situation has happened even more severely as a major carrier increased their deviated rate extensively last year in CA. Insurance carriers do have a team of actuaries that produce their own numbers that may not agree with the actuaries at the rating bureaus. The insurance carriers are going to apply their own rates to remain profitable. I will provide an example with numbers next week. I try to keep most articles to 300 words or less and this one is getting a little long to read. California’s Workers Compensation difficulties may have subsided for a few years. However, it seems that it was only a temporary situation. Workers Compensation Action Network (WCAN) recently responded to ProPublica’s and NPR’s analysis of Workers Comp in California. A recent responsive article was also published on this blog – In Defense of Workers Compensation. 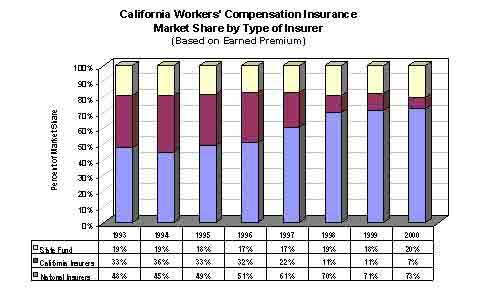 I am often asked why I write a large number of articles on California’s Workers Compensation system. California is a leading bellwether of WC (of sorts). In other words, what happens in the state will likely become part of the WC environment in your location or states of operations. The article actually turned out to be a great quick primer on quite a few developments in California over the last few years. One note is Propublica did meet with a few of the Workers Comp press and requested input on future WC subject matter. Even if your company has not exposure in CA, I recommended reading the seven page analysis published by WCAN. They performed a yeoman’s job to bring together the article. Please note the response is a PDF file. Premium rates in California are 30% higher than they were four years ago. That is a significant increase when many states are experiencing rate decreases. Since 2004, average total benefits per claim in California have increased by 35%, or $18,000 per claim. Average payments for medical benefits per claim increased by 40%. Average indemnity (cash) benefits paid to injured workers increased by 27%. Benefit costs did decline briefly after enactment of SB 899 (2004). However, this trend only lasted for three years and costs declined by only 17% before beginning to increase again in 2006. When one looks at these statistics, California may not necessarily be in an “insurance crisis“, however the cost of covering workers is becoming even more of a significant budget burden on California employers.